The place to be when wearing a Four Corners apron! Teresa is on the back right. Madie is next to her. That's all I know but you can just call all the other Angels! "A side story for you: I placed an assignment in the pocket of each apron, such as dish the casserole, plate the salad, pour the drinks, etc., etc. As servers arrived, they chose an apron and checked their pocket for their assignment. The aprons really facilitated handing out assignments. I didn't have to choose who would do what. I love this pattern. 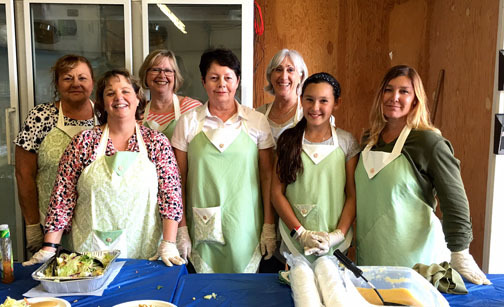 The aprons were well-received." Well, her picture was well-received here at Vanilla House. Mostly we loved the big smiles while doing such good deeds, and yes, cool, they are all wearing a Four Corners! Wish I was there with them! A Bohemian version of our signature Four Corners Apron!